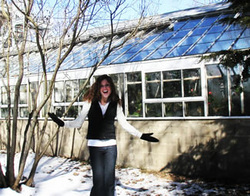 Merril grew up in Minneapolis, MN, where she spent the majority of her childhood and high school years in an ice rink. Since a young age Merril was concerned with the environment and actually once begged her mom to allow “highway cleanup” be an activity at her birthday party. As she grew older she realized there was more to environmental degradation than could be fixed with simple “beautification” efforts. Deciding she wanted to see a new part of the country, Merril headed east to Boston College where she pursued a major in Environmental Geosciences and a minor Hispanic studies. While Merril values the entirety of her college experience, her semester-long study abroad experience in Ecuador was particularly eye opening and life changing. It was there that she discovered her passion for other cultures and languages. In addition, the spring of her senior year, Merrill’s involvement in the creation of BC’s first organic vegetable garden was unforgettable. The garden instilled in her a hope for the future; a vision of access to local, healthy, homegrown, food at a community level. Itching to return to Latin American, after graduation Merril headed to Honduras to spend a year in the lovely town of Copán Ruinas. It was in Copán where she ran into one of Dr. Mihelcic’s current students and learned about the Masters International in Environmental Engineering program at USF. She could not imagine a better way to couple her passions; the environment, sustainability, culture, community, and living abroad. Before she knew it, she had arrived to Tampa! When contrasted to her compact life in Copán Ruinas, life in Tampa has increased Merrill’s awareness of the social, psychological, and environmental disconnect caused by current development patterns in the United States. In particular, she recently rediscovered her interest in the management of stormwater runoff; reducing its quantity and improving its quality as to reduce the negative impact it has on human and ecosystem health. In the Peace Corps Merril hopes to explore existing stormwater management patterns/practices, and modify, expand upon and/or develop new low impact development (LID) techniques to best suit the needs of her community. Upon return Merril envisions a career where she is involved in city/rural revitalization/development projects that seek out thoughtful, creative, and sustainable methods to create, maintain, or restore a healthy, mutually beneficial, relationship between people and their environment.